The guitarist and composer Manuel Göttsching has been at the forefront of two musical revolutions. 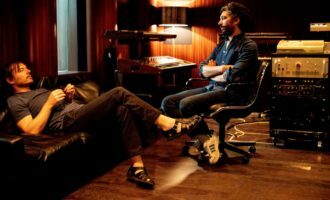 With his band Ash Ra Tempel, he helped shape German experimental rock in the early 1970s and, under his own name, he pioneered electronic dance music in the 1980s. Along the way, Göttsching has also made major contributions to ambient and minimalist musics. 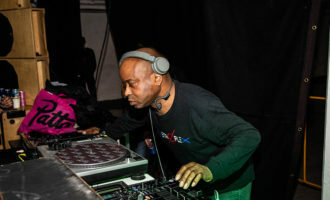 His importance in the creation of modern dance music, in particular, is impossible to overestimate. 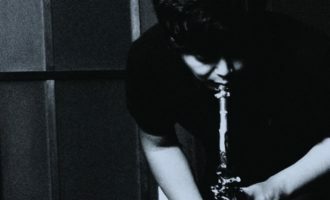 Classically trained, Göttsching’s interest switched to rock during the mid 1960s where his primary influences were Eric Clapton, Jimi Hendrix and Peter Green. His first band of note was The Steeple Chase Blues Band. The line-up included Göttsching’s schoolfriend and soon-to-be Ash Ra Tempel founder member Harmut Enke on bass. But while most late 1960s European rock adhered to models forged on the US west coast and in Britain, German musicians, Göttsching among them, rapidly developed a distinctively local aesthetic dubbed Krautrock by the British music press, which embraced European avant-garde electronica and minimalism. 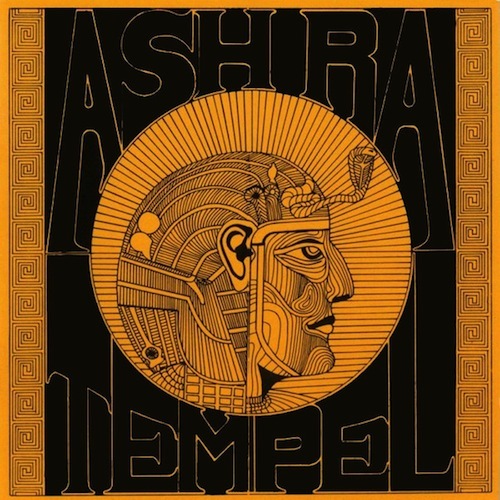 Ash Ra Tempel, formed by Göttsching in 1970, included the drummer and electronica experimentalist Klaus Schulze as another founder member, and was in the vanguard of the new music along with bands such as Tangerine Dream and Can. The three founder-members of Ash Ra Tempel went their individual ways in 1973. Enke retired from the music business entirely, Schulze left to follow a solo career. 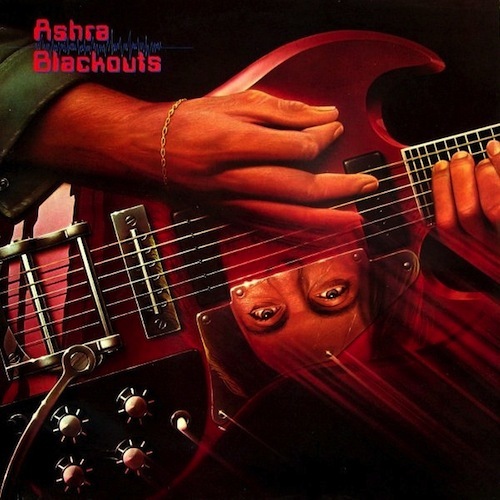 Göttsching, whose first instrument remained the guitar but who had by now added keyboards and electronica to his palette, continued recording under his own name or as Ashra. In 1981, he recorded the solo album E2-E4, released in 1984, which, justifiably, is often cited as the first electronic dance music album. There is barely a dud in Göttsching’s discography. Here are 10 of his most notable discs, made with Ash Ra Tempel in the early 1970s and as a solo artist between 1974 and 1997, when he moved almost exclusively from vinyl to digital releases. 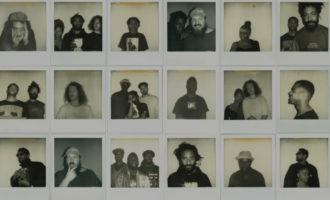 Now, to mark his return to vinyl, as the subject of Daniele Baldelli’s truly cosmic remix EP Volcano Extravaganza, we’ve picked ten important milestones for newcomers and Göttsching disciples alike. 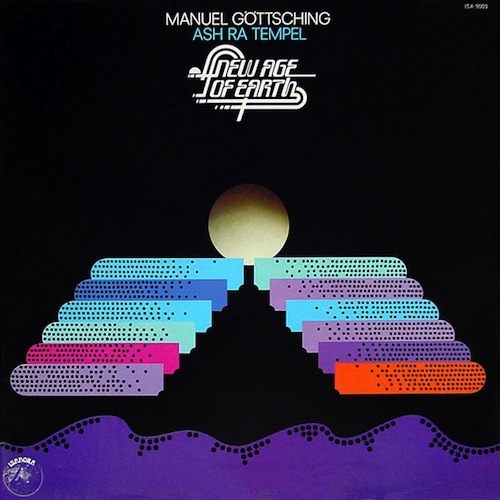 Göttsching, Harmut Enke and Klaus Schulze came together as Ash Ra Tempel in 1970 in what was then West Berlin. The trio had previously played together in Eruption, a band led by string player Conrad Schnitzler (like Schulze, an ex-member Tangerine Dream). Surrounded by Soviet-controlled East Berlin and the repressive German Democratic Republic, West Berlin was an outpost of liberal, countercultural ideas, with an acid-head scene in which Göttsching, Enke and Schulze were enthusiastic participants. The magnificent Ash Ra Tempel, in its own way as trippy as anything ever recorded by the Grateful Dead, was the band’s debut and established the blueprint for the next few albums: two side-long tracks, the first a slow-burning sonic explosion, the second a more reflective affair which at times sounds like a curtain raiser for Brian Eno’s ambient experiments later in the decade. Another mind-bending treasure. By the time Schwingungen was recorded, Schulze had left Ash Ra Tempel to launch a solo career (returning briefly in 1973). He was replaced by Wolfgang Müller on drums and vibraphone. Göttsching, playing organ in addition to guitars, became sole keyboard-player and the line-up was expanded to include saxophonist Matthias Wehler and percussionists John L and Uli Popp. Despite the personnel changes, the music maintains the trajectory of the band’s first album, with side one space-rocking out, and side two taking a more meditative path. 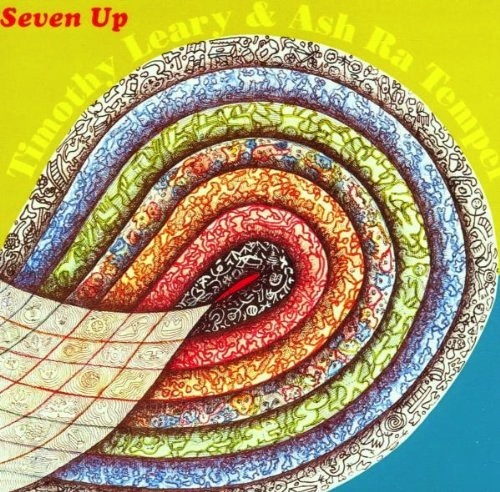 Seven Up, Ash Ra Tempel’s third album, part-recorded at the Bern Festival in Switzerland in summer 1972, flew the counterculture’s flag high by including acid guru Timothy Leary as a guest vocalist. Leary, described by President Richard Nixon as “the most dangerous man in America,” was at the time on the run from a US jail sentence and holed up in Switzerland, which had refused requests to extradite him. In retrospect, Leary’s involvement is of more semiotic than artistic significance. The album’s magic lies in the instrumental passages, rather the Leary’s delivery of the gnomic lyrics he co-wrote with the British artist Brian Sydney Barritt (a spookily-synchronous name if ever there was one). 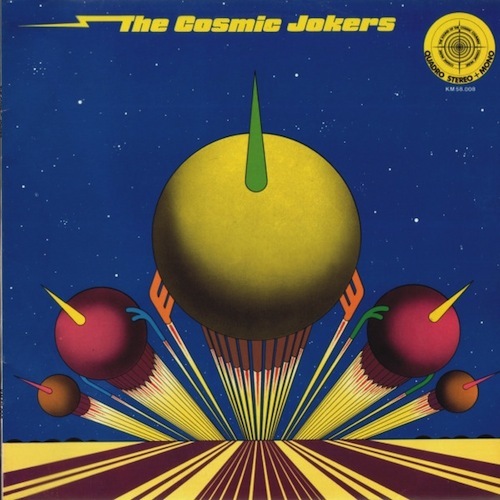 Recorded in 1973, shortly after Enke had left Ash Ra Tempel and during Schultze’s brief return, The Cosmic Jokers was compiled from a series of warm-up studio-jams which the band never intended to be released. 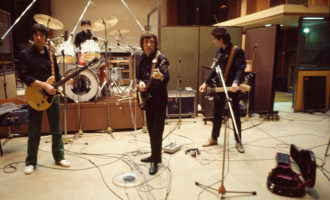 Indeed, legend has it that the musicians were so out of it during the sessions that they did not notice producer Rolf-Ulrich Kaiser had a tape running. 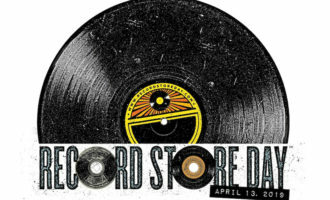 Göttsching is said to have first heard the album on a record store’s sound system, enquired who was playing and discovered it was his own band under another name. Other albums released from the sessions were also credited to The Cosmic Jokers. This is the first and the best. 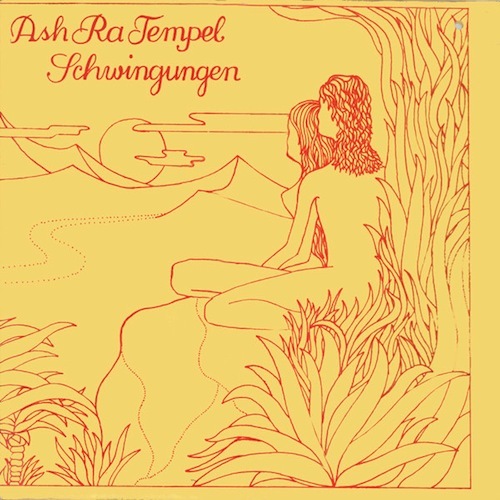 From 1974, with both Enke and Schultze gone from Ash Ra Tempel, Göttsching recorded as Ashra or under his own name. 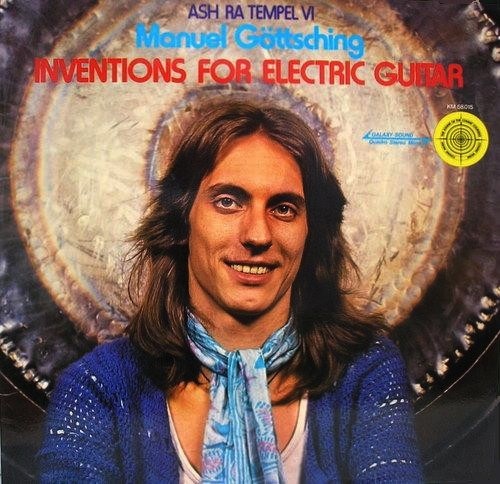 Inventions for Electric Guitar was given a secondary credit as Ash Ra Tempel V1 to suggest continuity (the band’s third album Seven Up having been followed by Join Inn and Starring Rosi). Recorded over two months in 1974, Inventions for Electric Guitar is a cinematic soundscape built around layered, electronically treated guitars and innovative time-delay manipulations and rudimentary looping. Groundbreaking and virtuosic. For his second solo album, credited to Ashra on reissue, Göttsching played keyboards, synthesisers and drum machines in addition to guitar. Despite the title, New Age of Earth is free of the longueurs of what a decade later became known as new age music. It is instead an ambient-inclined album which generally foregrounds keyboards over guitar and which comfortably fits Eno’s definition of ambient as “rewarding attention but not being so strict as to demand it.” A (mostly) gentle masterpiece. A landmark solo album which moves between ethereal keyboard passages and fluid, but often heavy, guitar riffs and improvisations. Some reissues have credited Udi Arndt as second guitarist. In fact, Arndt’s contribution was as a guitar technician, albeit one to whom a grateful Göttsching paid credit in the sleeve notes. Blackouts is the source of the many-times revisited track ‘Shuttlecock’, whose latest incarnation is Göttsching’s cosmic fellow-traveller Daniele Baldelli’s sumptuous remix on his new VF EP, Volcano Extravaganza. 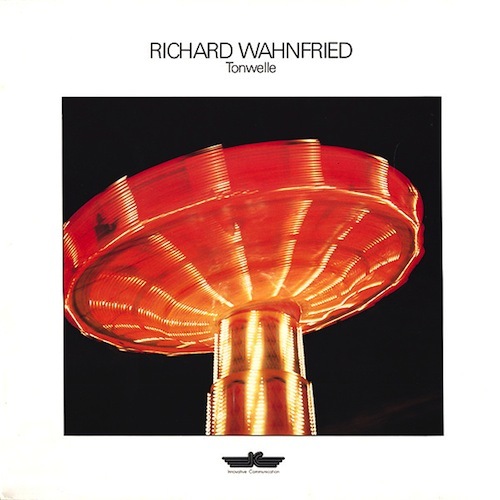 Richard Wahnfried was the name adopted by Klaus Schultze for a series of albums on which he explored the interface between avant-garde electronic music and library music. 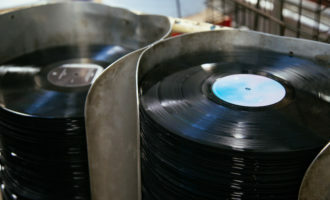 Tonwelle was the second disc in the series and featured Göttsching on guitar along with Santana drummer Michael Shrieve (in 1984, Schultze collaborated on Shrieve’s electronic album Transfer Station Blue). Tonwelle’s aesthetic is along the arc established by British library-music composers Basil Kirchin, Ron Geesin and John Baker in the 1960s and early 1970s, in which serious sonic and structural experimentation co-existed alongside easily-digestible melodicism. 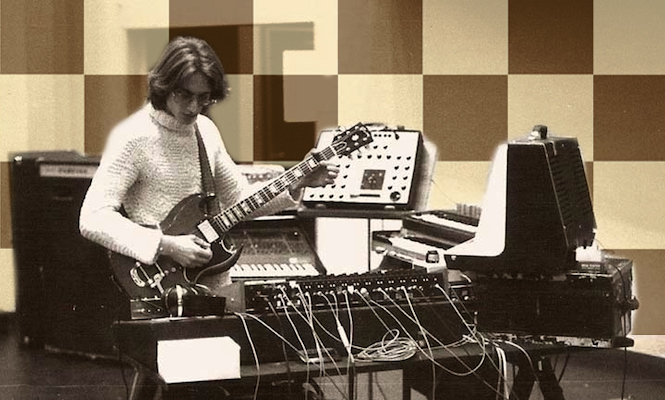 Göttsching adds feisty lead guitar to Schulze’s synthesisers. Often cited as the first electronic dance music album, E2-E4 was recorded in 1981. It was released in 1984, when its repetitive, trance inducing, guitars-and-synthesisers-and-beats arrangements were still profoundly revolutionary. 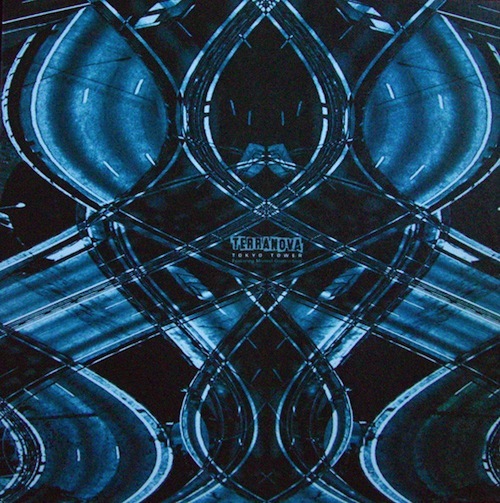 Among numerous remixes, samplings and homages, Sueño Latino’s eponymous EP – a Balearic hit which spread across European rave culture in 1989, and which still has legs – was based on the album. 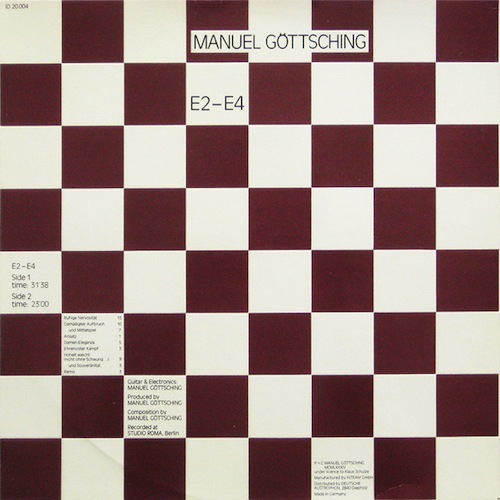 In 2007, in the liner notes to the 25th anniversary edition of E2-E4, Göttsching suggested the game-changing disc was an off-the-cuff creation, made for his own amusement, which he did not originally plan to release: “… and here I was with a finished, faultless recording, which I had written, played and produced within the space of one evening. Should I take the whole thing seriously or dismiss it as playing around and shove it away in a drawer somewhere: an intermezzo for the archives? I listened to the tape over and over again. It certainly was playing around, but pretty damn good playing around.” E2-E4 is to modern electronic dance-music what Terry Riley’s In C was to minimalism in the mid 1960s or Brian Eno’s Another Green World was to ambient in the mid 1970s. One of the final releases on the shortlived drum & bass label All Good Vinyl, ‘Tokyo Tower’ is a lush, dreamy blend of electronica and mellow hip-hop which brings to mind Tricky’s post-Massive Attack, mid-1990s work. 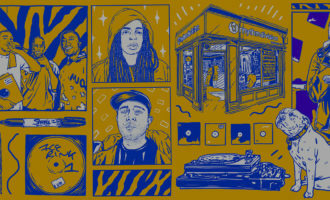 A stone-delight vinyl sayonara.